Ok, so in the last two years I’ve been exceptionally quiet on posting any articles. It’s quite amazing considering the “excellent track record” I previously had. There are many reasons which I won’t bore you with, but if you’re curious I did post an article why I gave up sponsorship which you’ll find under articles. But here I am posting an article, can you believe it, and indeed, it’s not about rivers? 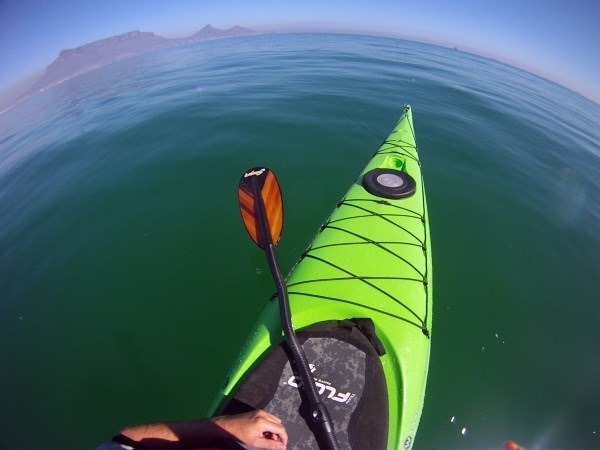 I’ve been wanting to sea kayak for a very long time. Mostly the high cost of the sea kayaks themselves had been putting me off. But with the passing of my father last year November I thought screw this. What is the point of holding back, and living frugally and then for what? Nothing. So I decided let me just buy the damn boat and do this. And I’m glad I did. Life is short. If I sit around moaning about working a five day week and missing the rivers in winter, and then wondering about them in summer time when they’re bone dry I’ll go crazy. Yes I do admit, windsurfing is still my number one sport. Always has been, most people just thought I was only a kayaker. 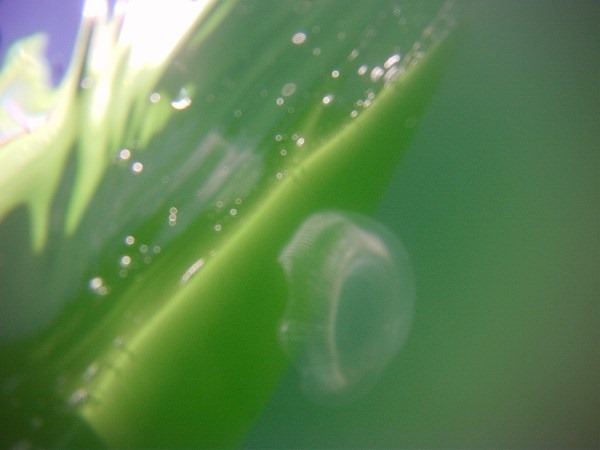 In fact I’d been windsurfing for 5 years already before I started kayaking. 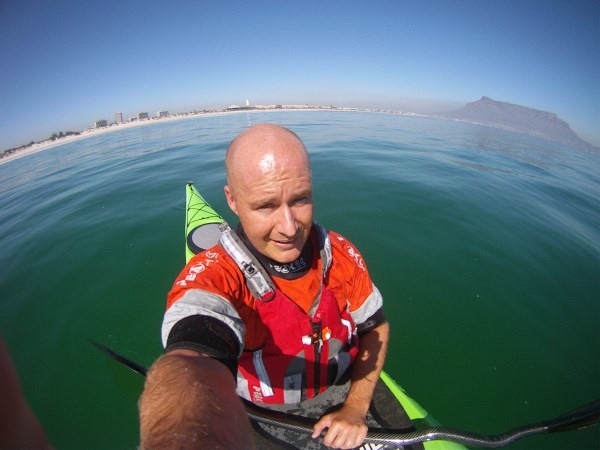 But the fickleness of the rivers in the Western Cape Province of South Africa has led me to start sea kayaking, and let rivers take a back seat. Factor 50 on my head, although I usually wear a cap! I’m using a Sawyer Orca V-Lam. The old one. I see they have a new shape now. 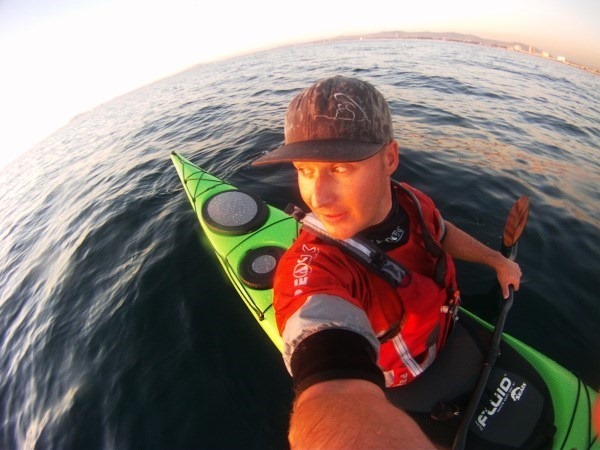 I used to be sponsored by Sawyer and requested two sea kayaking paddles but only recently got to use them. They are lovely to use. Carbon shafts, 2 piece, and very light weight. And of course, a delight to look at! 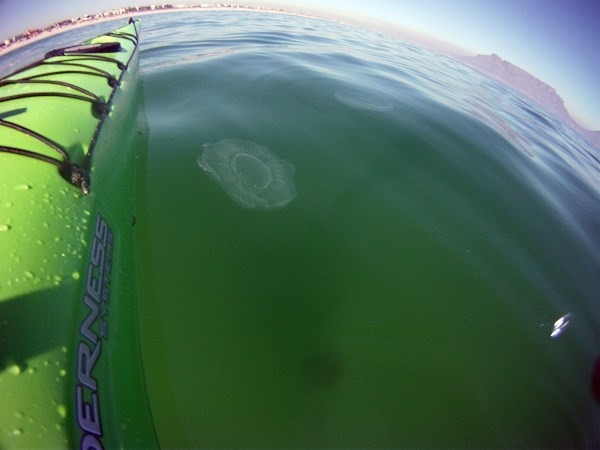 So many jellyfish floating around that day. 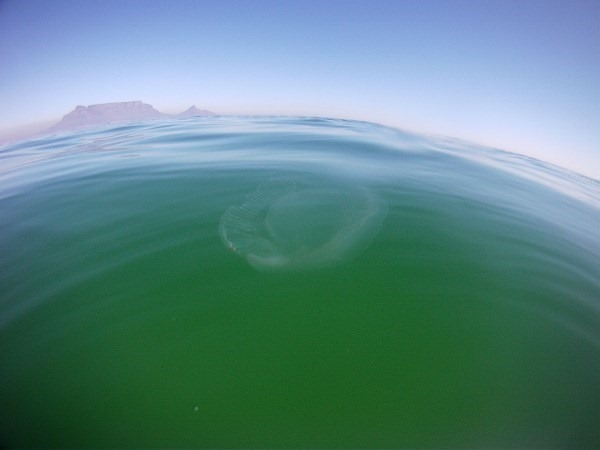 Very unusual for Cape Town. Tuesday after work I went out to clear my head. 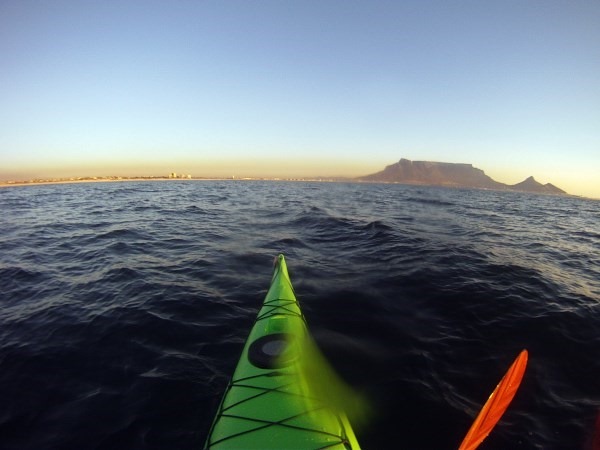 It was really excellent to sit 1km offshore and watch the sun go down all alone as the wind dropped slightly. Times like that make the struggle to wade through the boring normality of daily life well worth it. So far I’ve only managed to get out three times. But it’s been heavenly, and quite a difference experience. 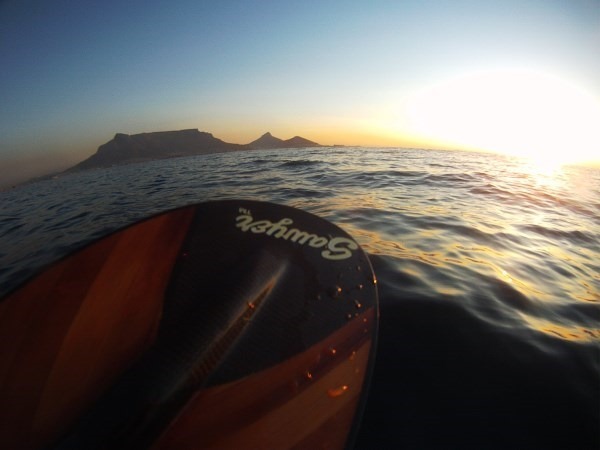 Waves have been very small when I’ve been out so far, and the first mission was a perfectly glassy day with crystal clear water to boot – just perfect. The boat I got is a Wilderness Systems Tempest 170 in the plastic version, which I had to order from the USA from Canoe and Kayak World in Johannesburg. The wait was worth it. A lovely boat which I’ll review later this year, but very satisfied with my purchase. 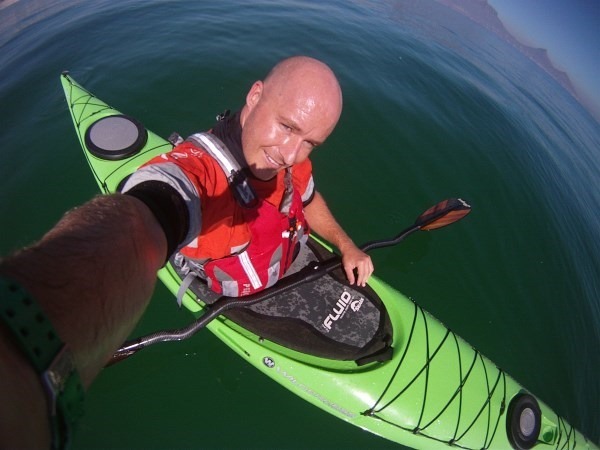 Having paddled whitewater boats for many years, the transition to sea kayaking may seem boring to some, but not to me. The adventure aspect and point A to B has always appealed to me, and considering my love of the ocean this is right up my alley. So far I comment that it’s a breeze to paddle and by far the easiest boat I’ve ever rolled. That was very surprising. In a few months time I’ll surely be posting some photos of an overnight trip or two that I’ll be doing, so stay tuned. Until then, paddle safe.